Runs and wickets from Australian paceman James Pattinson and England's Stuart Broad put Nottinghamshire firmly in command at Leicestershire. Ben Raine (6-66) had helped reduce the visitors to 167-7, still 84 runs adrift of the hosts' first-innings 251. But Broad (52) and Pattinson (89) added 122 for the eighth wicket to help Notts to a 78-run lead. Luke Fletcher then piled in with three wickets as the hosts slumped to 51-6 at the close. 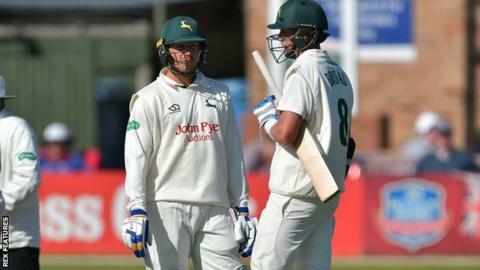 Making his Notts debut, Pattinson hit 14 boundaries and two sixes in his 108-ball knock, and then had opener Harry Dearden caught behind by Chris Read with the ninth ball of Leicestershire's second innings. Fletcher replaced Broad, who trapped Paul Horton lbw for two, and produced an excellent spell of line and length to dismantle Leicestershire's middle order, putting Notts on the brink of victory. "Broady and I managed to put together a good partnership and then to come out and get six wickets was a bit unexpected. I thought everybody bowled well, particularly Fletch from the Pavilion End. "I wasn't too disappointed [not to get to three figures] - I was pretty happy with what I'd done, and then to get the wickets we did made it a pretty good day. "At the moment I feel I've got pretty good rhythm, the sort when you run in and it almost feels as though you're not really trying." "Career-best figures are nice but it doesn't feel that good right now. "Broad and Pattinson had a good game plan: when the ball gets old it gets easier to bat on this pitch, but fair play to them, they took it away from us. "I felt confident we'd get through the evening session, and it's hard to explain. We'll come back tomorrow and fight."